Twenty imaginative undergraduate students from diverse backgrounds are exploring ways to create sustainable energy solutions while gaining valuable research experience through the new interdisciplinary Bioenergy Minor established in fall 2012 at Oregon State University (OSU). In addition to coursework, the bioenergy minor requires that undergraduates complete a unique, authentic research experience with a mentor. Shanti Johnson is testing the gelling point of biodiesel in David Hackleman’s lab. Core courses for the minor allow students to interact with students from many different disciplines and apply coursework to research and problem solving. Students come from a wide variety of backgrounds including mechanics, art, and farming and represent an array of OSU majors including forestry, economics, political science, biochemistry, renewable materials, and bioresource research as well as biological, chemical, or environmental engineering. Many students arrive with firsthand, practical knowledge that enhances their educational experience in the bioenergy field. Because of his experience as a diesel mechanic, Johnson is interested in alternative energy sources. For his research project, Johnson is investigating ways that biodiesel can be used at lower temperatures without gelling, which can clog filters and ruin engines. 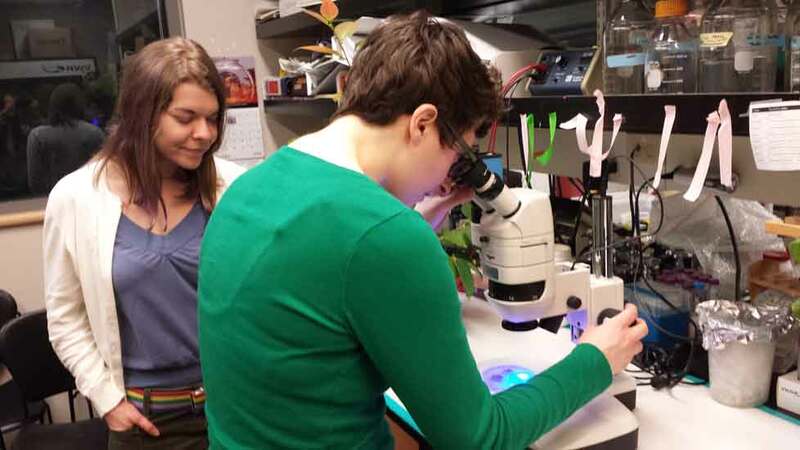 Crystal Oldfield (right) and Britany Swann (left) are looking at a potential bioenergy feedstock, eucalyptus, in a lab at OSU. Crystal Oldfield, a bioresource research major, also has a bachelor’s degree in art. Oldfield loves the creative aspects of art and science and finds that the Bioenergy Minor fits well with her passion to help creatively solve energy and sustainability problems impacting the world today. She is interested in the chemistry of treating biomass for biofuel production and using biochar for agricultural applications. 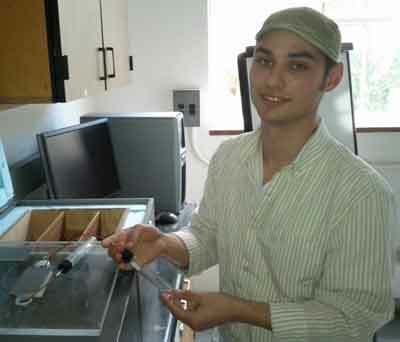 Brian Dougherty comes from a farming background and returned to school to study ecological engineering at OSU. He believes that finding alternative ways to fulfill our growing energy demands is the greatest challenge humanity faces, and that bioenergy will play a key role in any attempt to transition away from fossil fuels. Dougherty plans to investigate the potential of different feedstocks for energy production. Other students in the minor are working on the identification of enzymes and microbes used for the production of biofuels and bioproducts. In addition to the research experience, students in the minor also appreciate networking opportunities, first-hand exposure to the industry through field trips and from examining relevant companies, and keeping up with the latest research via guest speakers. Bioenergy minor students realize that our future energy and climate challenges present exciting opportunities for creative innovators. These students all want to be part of the change that leads to a sustainable energy supply.